ZIMBABWE are set to put behind them the disappointment of the recent Boxing Day Test in South Africa when they regroup this weekend for a marathon preparation that will take them to the 2018 ICC Cricket World Cup Qualifier set for different venues in this country in March. The Chevrons, who returned home from South Africa at the weekend, only had a few days with their families before shifting focus to the hectic two months programme. 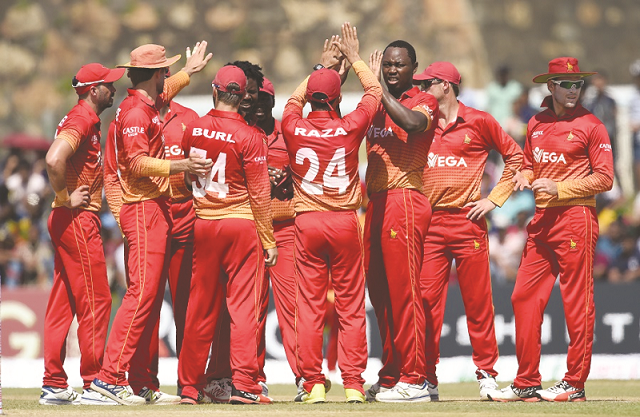 They are expected to regroup in Harare this weekend ahead of the departure for Bangladesh early next week where they will feature in a triangular One Day International series involving the host nation and Sri Lanka from January 15-27. From Bangladesh, Zimbabwe head off to United Arab Emirates to take on Afghanistan in a five ODIs and two-Twenty20 International before they return home for the Qualifier warm-up matches at the end of February. Chevrons coach Heath Streak yesterday said they are looking to banish the ghosts from the recent tour of South Africa were they were humiliated by the Proteas in a heavily lopsided pioneering four-day test match which ended in a massive innings defeat inside two days. In their misery, Streak said they took home some big lessons after they were bowled out for 68 and 121 runs in the David versus Goliath affair and are now looking to bounce back in the limited overs version with a busy schedule set ahead of the World Cup Qualifier. “The limited overs game is one of the formats that we enjoy the most and we are hoping to pick ourselves up from the disappointment of the previous outing. “In fact, the South Africa Test was part of the preparations for the World Cup Qualifier. We returned home at the weekend and the guys have had a few days off and will be back in training towards the end of the week. “They will be having one on one sessions this week and we will have fitness sessions as well,” said Streak. The Chevrons are hoping for some positive performances to boost their confidence during the triangular series in Bangladesh. The Zimbabwe Cricket selectors were yesterday finalising the ODI squad, which should be announced today. Solomon Mire, who travelled to South Africa but did not play in the one-off match, returned to his base in Australia last Wednesday but is still part of Streak’s plans for the tour of Bangladesh. The Zimbabwe coach said he is looking forward to the busy schedule in the coming weeks, with the ultimate focus on the World Cup qualifying tournament. The event, to run from March 2-25 in Zimbabwe, will see 10 countries fighting for the two tickets available for the 2019 ICC Cricket World Cup to be hosted by England and Wales. “It’s important to get high volumes of cricket leading us into the World Cup Qualifier. It’s always nice to play quality opposition so that we get used to competitive cricket. “The good thing is that the majority of the players who were in South Africa are likely to make the ODI squad. We have had no injuries. Everyone is fit and well. We will meet two days before departure. “The guys will also have five to six days in Bangladesh before we play our first match including the warm up game,” said Streak.